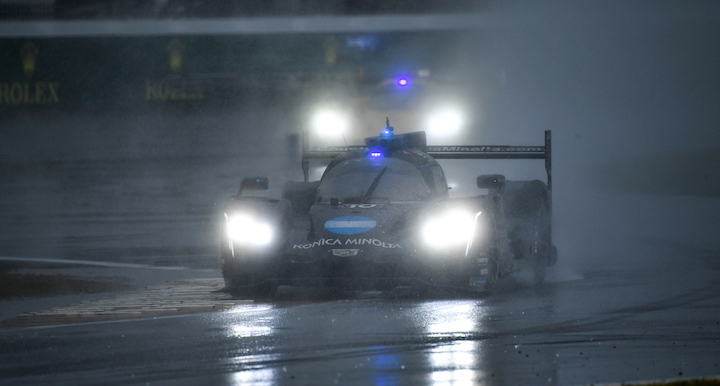 Fernando Alonso called for IMSA to red flag the 2019 Rolex 24 Hours of Daytona when he was still in second place due to poor visibility. Alonso and the Wayne Taylor Racing crew were running second behind the No. 31 Action Express Cadillac DPi-V.R of Felipe Nasr late in the race when Nasr went wide into Turn 1, forking the lead over to Alonso in the No. 10 Cadillac. IMSA brought out the red flag due to rain and poor visibility just a couple laps later and never restarted the race, giving the No. 10 car the win. The Spaniard, who is a two-time Formula 1 world champion and now races a Toyota LMP1 car full-time in the WEC, called for IMSA to stop the race or bring out the yellow when he was still behind Nasr in second. Alonso also said he “was just lucky in that moment,” when Nasr went wide at Turn 1. Many cars were hydroplaning on the approach to Turn 1 in the rain, which typically requires the driver to lean on the brakes heavily as they come off Daytona’s long home stretch. Tommy Milner crashed the No. 4 Corvette C7.R at Turn 1 earlier in the race, sliding backward into the barriers in the early hours of Sunday morning.